We read up about what LTA has been doing and decided to focus this year's Annual Report to focus on "Walk Cycle Ride SG" — a vision to be an inclusive Singapore that enables everyone to take part in our lively city. Public transport is made more accessible, with more infrastructure for better walking and cycling commutes towards a car-lite society. I decided to group the updates on infrastructure by categorising them to fall under "walk", "cycle" and "ride" and feature a commuter who walk, cycle and ride. 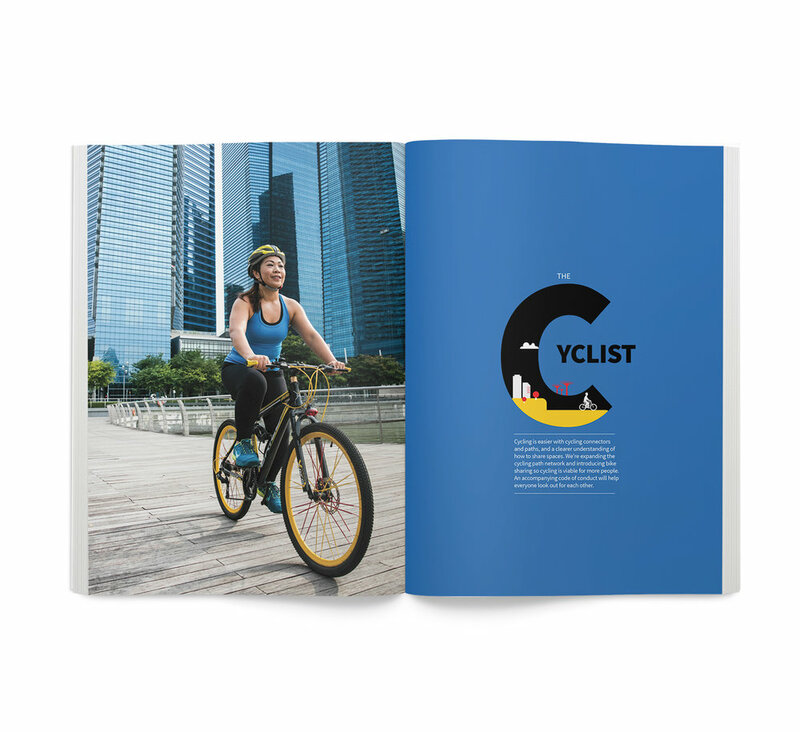 Using inter-connected circles that combines three circles together each in a different colour shade, the cover features a look into civilians walking, cycling and taking public transport. The features are later reflected in the book’s divider in interviews and LTA’s new infrastructures for Singapore. The approach of the report is picture and infographics heavy with little text for easy reading. Short information of the train lines were depicted with a zoomed in version of the map and illustrations.